The National Thoroughbred Racing Association (NTRA) announced today that the 43rd annual Eclipse Awards, presented by Daily Racing Form, Breeders’ Cup and The Stronach Group, will be held Saturday, January 18, 2014, at Gulfstream Park Racetrack and Casino in Hallandale Beach, Fla. The Eclipse Awards are bestowed upon horses and individuals whose outstanding achievements have earned them the title of Champion in their respective categories in 2013. The 2014 Eclipse Awards will mark the second consecutive year the event will be held in the Sport of Kings Theatre at Gulfstream Park. The 2013 Eclipse Awards attracted a sold out crowd of 550 attendees and served as the culmination of a weeklong series of events and festivities that raised more than $120,000 for designated charities. 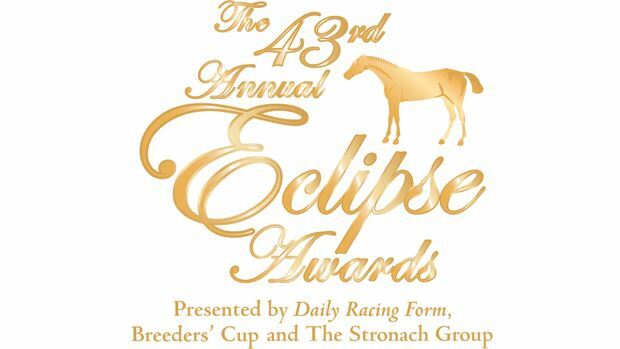 The 2014 Eclipse Awards will include many of the same events and be expanded even further. Events include a golf tournament, celebrity poker tournament, slots tournament, a handicapping tournament qualifier to the Daily Racing Form/NTRA National Handicapping Championship in Las Vegas, world class Thoroughbred racing and a series of fan-focused events themed around Eclipse Awards Champions Week at Gulfstream Park. Other events will be announced in the coming months and Eclipse Awards tickets will go on sale later this fall. “We are delighted to once again be hosting the Eclipse Awards, and we look forward to making this a memorable week for our guests visiting from out of town and for all of our racing fans in South Florida,” said Tim Ritvo, President and General Manager of Gulfstream Park Racetrack and Casino and Chief Operating Officer of the The Stronach Group. The Eclipse Awards, presented by Daily Racing Form, The Stronach Group and Breeders’ Cup, are produced by the NTRA. The Eclipse Awards are named after the great 18th-century racehorse and foundation sire Eclipse, who began racing at age five and was undefeated in 18 starts, including eight walkovers. Eclipse sired the winners of 344 races, including three Epsom Derbies. The Eclipse Awards are voted upon members of the National Turf Writers and Broadcasters (NTWAB), Daily Racing Form and the NTRA.